One of the prominent western badmen of the late ‘40s and early ‘50s, Lane Bradford was born Myrtland LaVarre Jr. (son of John Merton—Myrtland V. LaVarre—1901-1959) on August 29, 1922, in New York City. At that time his father was a stage actor based in New York before coming west in ‘32. Bob LaVarre, Lane’s younger brother and a sometime actor (“Sky King”, “Hawaii 5-0”) who became a cameraman on films (“Against A Crooked Sky”) and TV (“Dukes of Hazzard” etc. ), told the Goldrups Lane was “all over everywhere” during his younger days in California and soon found a love for Hawaii and Hawaiian music, learning to play the guitar and ukulele for his own amusement. Lane brought a love of Hawaii to the whole family. 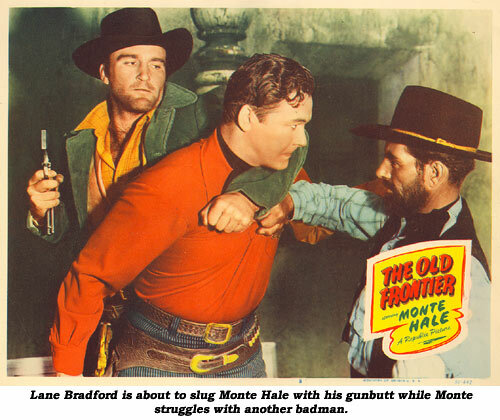 After the family moved from the San Fernando Valley into the heart of Hollywood in 1939, Lane started to work as an extra and stuntman with two of his earliest noticeable roles being in “Frontier Crusader” and “Riders of Black Mountain” (both ‘40) with Tim McCoy at PRC. 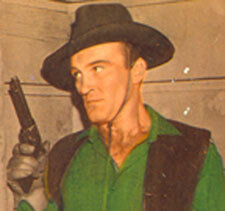 Following that he was seen sporadically over the next few years in “Lone Rider in Ghost Town”, “Lone Rider Crosses the Rio”, “Medico of Painted Springs”, “Raiders of the West”, “Western Cyclone”, “North From the Lone Star”, “Fighting Buckaroo”, “Riders of the Badlands”, “Thundering Trails”, “Marshal of Laredo” and the “Valley of Vanishing Men” serial. Lane’s career started to come into focus and work picked up considerably from ‘46 on. He was seen in the westerns of Buster Crabbe, Lash LaRue, Eddie Dean, Allan “Rocky” Lane, Johnny Mack Brown, Jim Bannon, Monte Hale, Roy Rogers, Rex Allen, Whip Wilson, Bill Elliott and others. 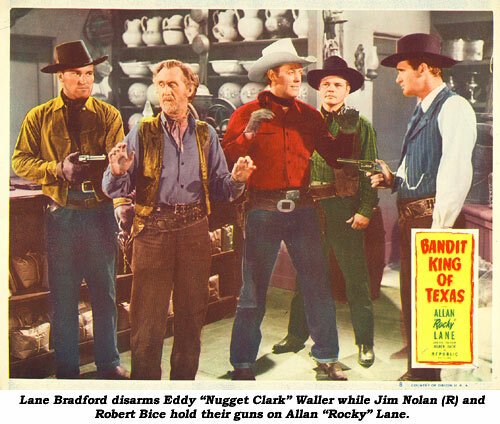 Lane was one of the busiest heavies on TV in the early days, appearing on “Annie Oakley”, “Buffalo Bill Jr.”, “Champion”, “Cowboy G-Men”, “Cisco Kid”, “Fury”, “Frontier Doctor”, “Gene Autry”, “Lone Ranger”, “Hopalong Cassidy” right on through the heyday of TV westerns with “Cheyenne”, “Bronco”, “Black Saddle”, “Bonanza”, “Gunsmoke”, “Have Gun Will Travel”, “Laramie”, “Lawman”, “Tales of Wells Fargo”, “Sugarfoot”, “Wagon Train”, “Maverick”, “Rawhide”—virtually every TV western ever made. And still he found time to continue working in the A-westerns of the period—“Drums Across the River”, “Kansas Pacific”, “Shootout at Medicine Bend”, “Lone Ranger and the Lost City of Gold” etc. Lane’s big love in life was boats. He first built an 18 ft. outrigger canoe and sailed it from his home in Malibu. Next he bought a 26 ft. ocean-going Folk Boat and later a P-28 which he took to Hawaii where he lived his last few years until his death from a heart attack June 7, 1973, at only 50 years old.